I am not competent to review books but having read the debut novel of Bragadeesh Prasanna, a blogger I like and a person I admire for many reasons I thought I should give my views on the same. This novel made me do a couple of firsts, I actually overcame my aversion to reading novels on devices and finally downloaded a Kindle app for my desktop and my phone for this novel, I finished this novel on these two devices at a stretch and found that it was an interesting experience. 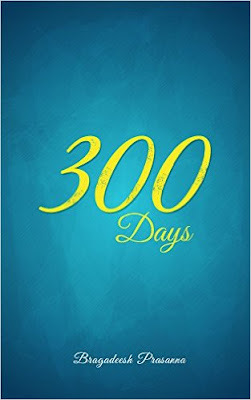 It is a romantic novel and it goes by the name 300; the reason behind the name is given in the novel and I wondered if this name or rather the pet name of one of the protagonists should have graced the cover since it was repeated several times in the book. Those who are fans of the Gautham Menon style of story-telling will like this book, it appears semi- autobiographical, heavily referenced from real life, moves at a languid pace, lots of detailing with small quirks that the viewers may scoff outwardly but secretly warm up to. You always suspect that Gautham Menon lives out his lost dreams through his movies and you may wonder the same here too. There are no spoilers here so those interested in a love story must read the book to see how love triumphs in the end as it usually does in the movies even with a twist. - Typos could have been checked, tighter editing and trimming of some portions would help. Like in the movies sometimes you feel that some flab can always be reduced. - The opening scene and the shift to the flashback was abrupt and it threw me off for a moment despite the epilogue. - The climax seemed inevitable and almost predictable, maybe like the movies the other heartbreak could have been healed to leave a smile on the face of the reader? You can find this novel here. Go ahead, read it and support a new author!! !